Using the first-hand accounts of former child detainees and their parents, the book details the impact of mandatory detention on boatpeople and other unlawful entrants before the policy was watered down. "We think there are still a lot of unanswered questions about how the system operated and continues to operate," she said. "A royal commission would be able to establish how much really has changed, and whether there is true accountability now in the system." This is a page for published media reviews, opinion pieces and associated reactions to the publication in the press. New Matilda, Bad Old Days of Mandatory Detention to Come Back? 31 October 2008: Human Rights Overboard: the Perth launch with Carmen Lawrence and Fred Chaney - with many photos. "The Australian Council of Heads of Schools of Social Work called the People's Inquiry to conduct an independent, open and transparent investigation in order to give voice to those previously silenced, to influence policy and to place the stories of detention on the public record." 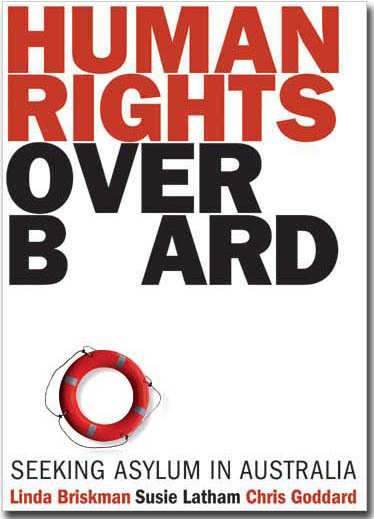 19 August 2008: Human Rights Overboard: Seeking Asylum in Australia - Human Rights Overboard draws together, for the first time, the oral testimony and written submissions from the inquiry in a powerful and vital book that stands as an indelible record of one of Australia's bleakest legacies. "This is a profoundly important book. It is an unflinching look at disgraceful events. Too many Australians allowed these things to happen. Our generation will forever be marked with the shame of it. It is not only an epitaph for the Howard government: it is also a caution to future generations." By early 2003, Mohammad Mastipour, an Iranian national, and his seven-year-old daughter Massoumeh had been detained at Baxter immigration detention centre for two years. Due to harassment from other detainees, Mohammad had requested that they be moved to another centre. On 8 July, after months of inaction from centre management, Mohammad began a hunger strike to draw attention to their situation. On 14 July, five guards entered the father and daughter's room and attempted to strip-search Mohammad, but he refused to comply in front of his daughter. He was handcuffed and taken to the "management unit" (solitary confinement). He was allowed to see his daughter, who had no other carers, for 90 minutes each day at 5pm. On 23rd July, Massoumeh was deported to her mother in Iran without Mohammad's knowledge or consent. That same day, Mohammad complained that he had not had the usual visit from his daughter. Detention management told him she was playing with friends and would visit the next day. When she failed to appear the following day, Mohammad was told she was already in Iran. He broke down, and was kept for the next six weeks in solitary confinement in a room with only a mattress, 24 hour lighting and constant CCTV surveillance. Two years later, Mohammad was found to be a refugee and was released from detention. This story is just one of hundreds of accounts of the treatment of detainees in Australia's immigration detention centres recorded in Human Rights Overboard. By itself, the story of Mohammad and Massoumeh Mastipour is a shocking tale. It has, however, many elements that are repeated throughout this book with alarming frequency: the length of time adults and children are kept in detention; the use of extended periods of isolation as punishment; the exposure of children to violence and the mental deterioration of their parents; the deliberate inaction and cruel misinformation given to detainees from detention staff; and the distress of detainees caused by the powerlessness of their situation. The research for Human Rights Overboard was motivated by the Cornelia Rau scandal. Like many other people, the authors were concerned that the behaviour of a woman with psychosis held for ten months in Baxter detention centre could seem normal to authorities, and that authorities did nothing about her despite repeated calls by her fellow detainees. If Rau's behaviour was deemed normal and ignored, what else was happening in detention? The terms of reference of the Palmer inquiry into the Rau case did not extend to detainees in general. So, the Australian Council of the Heads of Schools of Social Work, led by Linda Briskman, Suzie Latham and Chris Goddard and under the oversight of Justice Marcus Einfeld AO QC, started their own inquiry. Their "People's Inquiry into Detention" travelled around the country taking verbal and written submissions from anyone who had anything to do with detention. The result is a book with over 400 pages of accounts that provide testimony to tragic impact of Australia's immigration detention centres. Why publish another book about immigration detention? Because no other book has approached the topic in such a comprehensive and systemic way, outlining each aspect of the policy and its impact in turn. The book documents the experiences of all detainees, including residents who have had their visas cancelled, visa overstayers, and foreign fishermen. These other categories of detainee are often excluded from the literature on immigration detention that has emphasised the role of detention in keeping people out, and underplaying its equally important function in removing people already living in the community. Importantly, Human Rights Overboard includes the voices of advocates, detention staff, and Commonwealth officers, including members of the Australian navy who speak about what they were asked to do in the name of border security. Written like a government inquiry report, the authors allow the words of the detainees and others to speak for themselves, and leave it to the reader to judge the efficacy of the policy. The focus of Human Rights Overboard, nevertheless, is on the treatment of asylum seekers subject to immigration detention. Between November 1992 and July 2008, the policy of mandatory detention provided that all asylum seekers who arrived in Australia by boat without a valid entry visa would be kept in immigration detention until their applications for protection were granted, or they were removed from the country. Over 90 per cent of asylum seekers who arrived in Australia this way were eventually found to be refugees and allowed to settle in Australia. The book covers all aspects of government policy as it affects this group of asylum seekers. It follows the dangerous journey to Australia from Indonesia by boat, a journey that was more perilous after 2001 with the introduction of Operation Relex. This policy required that the Australian navy use everything within its power to keep boats of asylum seekers out of Australian waters, including firing at vessels, dragging them back to international waters and, in at least one case, sabotaging an engine. The book also covers the complicated and drawn out application process that can leave asylum seekers in limbo, and in detention, for years. Finally, it covers the time out of detention, and the experiences of asylum seekers on different visas, including the Temporary Protection Visa, now abolished, which did not allow rights to travel or family reunion, and the Bridging Visa E, which does not allow the visa-holder to work, study or receive any form of welfare benefit, leaving them entirely dependent on charity. Mostly, Human Rights Overboard focuses on the experiences and treatment of people in immigration detention. The book examines the physical conditions of detention: the lack of services and facilities, including in some cases the lack of sufficient toilets and running water; the impact on children, including the high rate of mental illness and self-harm amongst children; the mental health issues within the adult population; the violence, abuse and degrading treatment from guards; the use of isolation, for times well beyond the limits of use in the prison and psychiatric systems; deportations, often carried out in the middle of the night with physical and chemical restraints; and the lack of access to the centres for lawyers and journalists, politicians and other human rights organisations to provide a measure of accountability and transparency. The effect of the stories contained within the book is cumulative. By the end, the reader is left with the picture of a system designed to punish and humiliate detainees, operating outside norms and standards of ethical behaviour, and contrary to our international human rights obligations. Human Rights Overboard describes a contradictory system. On one hand, many procedural decisions about particular cases in detention were micro-managed by the immigration department, and in some cases directly by immigration ministers Ruddock, Vanstone and Andrews. That the department knew about the poor conditions is evidenced by the superficial upgrades given to the centres before United Nations inspections. The department and the ministers also knew about the experiences of detainees, not least from the letters they received from the many concerned Australians, and some detention staff, who wrote on detainees' behalf. On the other hand, however, the book describes how the same department and ministers repeatedly failed to respond to requests from detainees, advocates and human rights organizations for basic medical care, access to lawyers, information on the progress of visas, and a basic level of accountability. How do we account for this contradiction in approach? The answer perhaps lies with Philip Ruddock's statement that detention is "not a holiday camp," and the assertion by immigration officials that "we don't want to make it so nice for them in detention that they won't want to leave." The reader is left with the impression that inaction from the government was an action in itself. For the abuses to human rights, then, the former Howard government must be held to account. There is no doubt that immigration detention is a system designed to deter, punish and humiliate detainees. Yet the abuse of the human rights of detainees cannot be entirely attributed to the system. Although there were many guards and detention staff who treated detainees well and with respect, there were many others who implemented daily petty abuses and acts of serious violence upon the detainees. The ABC program Four Corners screened on 15 September described a group of guards, recruited from prisons, as the "crash and bash" cohort. This cohort was responsible, no doubt, for the episode when four guards pushed to the floor and handcuffed a female detainee because she hid some bread down the front of her dress to feed to her three children between the designated meal times. Or the random acts of violence against children, including the time that a visitor to the centre witnessed a female guard kick a four-year-old child who was playing on the ground. For these examples of abuse, individuals must be held to account. On 29 July this year, the Rudd government made important modifications to the policy of mandatory detention, limiting the use of detention for health and security checks in the majority of cases. This policy shift must be applauded. It is the result of years of advocacy of many people within the Australian community, including the hundreds who contributed their efforts to the People's Inquiry. For many, however, this policy change has come too late. It is too late for the nineteen people who died in detention (twelve of whom died between January 2001 and June 2003), and for the people who have died after deportation. It is also too late for the children and babies who have lost years of crucial developmental time in a harsh and abusive environment, and for the adults who, according to psychiatric assessment, will continue to experience mental illness for the rest of their lives. In addition, it is still unclear what is going to happen with the newly constructed $400 million detention centre on Christmas Island, or how the policy will effect the Indonesian fishermen and people who have had their residency visas cancelled, who are still detained without trial. Human Rights Overboard now stands as a document in evidence of the tragic outcome of Australian policy. As a nation, we must do everything possible to ensure that such human rights abuses are not committed again in our name. Amy Nethery is a PhD candidate at Deakin University examining immigration detention. Detention is deeply unpleasant. That is why it is a form of punishment. It is also why habeas corpus is a fundamental legal principle. We know by painful experience that great oppression lurks in the ability of the state to imprison people arbitrarily. So we resist this with law and due process, to ensure detention exists only where necessary. Hence the controversy about two of the most infamous forms of executive detention of our age: the US's use of Guantanamo Bay in the war on terror and Australia's detention of asylum-seekers arriving unannounced by boat from about 2000. In obvious ways, the two are markedly different. The Bush administration positions Guantanamo Bay as a central defensive strategy of war, while even in our most idiosyncratic paranoia the same could not be said of Australia's asylum-seeker policies. Perhaps then, it is instructive that substantial similarities may be observed. And to help us observe them we have two contrasting books. Mahvish Rukhsana Khan's My Guantanamo Diary is an often humorous account of a young American lawyer's experiences acting for some of the most despised detainees on the planet. Human Rights Overboard is not remotely conversational or autobiographical. It is Linda Briskman, Susie Latham and Chris Goddard's full-scale interrogation of Australia's treatment of asylum-seekers. In fact, it aspires to be not so much a book as an inquiry: The People's Inquiry into Detention. Guantanamo Bay, of course, has become synonymous with torture in a way not typically associated with immigration detention. And this theme is never far away in Khan's book. We encounter familiar stories: of men forced to strip naked in front of female guards, regular beatings and repeated head-kickings, sleep deprivation, enforced stress positions, blindfolding, hooding and gagging. We meet detainees kept in darkness, forced suddenly to stare into bright lights and exposed to extreme temperatures. But Guantanamo detainees are the "worst of the worst" are they not? Certainly, in the case of 9/11 mastermind Khalid Sheikh Mohammed, that rings true, even if his confession under torture to a staggering array of terror plots doesn't. Still, it is a claim worth engaging, because while the employment of torture there has attracted criticism worldwide, less attention has been paid to the justification for it, that the victims are, to put it crudely, scum who deserve no less. It is from this point that My Guantanamo Diary derives much of its punch. It offers uniquely detailed, first-hand portraits of detainees that take us beyond the faceless evil they are so often deemed to embody. The portraits are discomforting for their obvious humanity. Take Ali Shah Mousovi, a pediatrician and Shi'ite Muslim who fled Afghanistan as the Taliban came to power. Having moved to Iran, he returned to Afghanistan in 2003 with the dream of rebuilding his homeland in the wake of the Taliban's fall. He lasted one night before American soldiers smashed down his door and took him to Guantanamo Bay. Eighteen months later he stands before a military tribunal without the ability to call any witnesses, accused of supporting the very regime he fled. In further irony, he is accused of having supported the Afghan jihad against the Soviets decades earlier. That allegation was true: he had been a doctor tending to wounded soldiers you know, the soldiers supported by the US government. In time, Mousovi was released. But the mere fact of his capture raises concern. Khan's stories reveal the regularity with which people were handed over to US forces by mercenaries. On invading Afghanistan, the US military rained down bombs and leaflets "like snowflakes in December in Chicago" boasted Donald Rumsfeld promising astronomical financial rewards to anyone who turned in Taliban or al-Qa'ida members. The results obeyed market rationality. Tribal and familial disputes now had a new means of resolution. A black market developed in abductions. We are talking about something as crass as innocent people being sold to the US military for huge amounts of cash. Little wonder that character after character in Khan's account reveals an innocuous back story, ending in their commercially driven betrayal. The overwhelming impression is not one of incorrigible evil, but of hapless misfortune. In Alfred W. McCoy's phrase, "not the worst of the worst, but rather the least of the least". We can expect Khan's account to be swiftly dismissed This is, after all, a lawyer writing about her former clients and finithfully passing on their excuses. We have no reliable way of assessing veracity. Except that the US Defence Department's figures tell a similar tale: about 5 per cent of Guantanamo detainees were captured as a result of IIS intelligence. A Seton Hall study found 86 per cent were captured by Pakistani police and Afghan warlords while the bounty market was flourishing. While there are unquestionably terrorists in Guantanamo Bay, most detainees were accepted uncritically as the world's most evil and dangerous men for no sound reason. Thus does the circle complete itself. "The indiscriminate terrorists who perpetrated 9/11 have elicited from the US an equally indiscrinninate response," wrote Ilarvard historian Niall Ferguson. By now, this indiscriminate violence is systemic. The abuse of Guantanamo detainees sounds so familiar because we have seen photos of it at Abu Ghraib. tar all the evasive dismissal of that scandal as the misbehaviour of a few bad apples, it is clear that this is its own culture. It is bigger than the individuals within it. All is connected: the indiscriminate detention, the propensity for abuse and torture, the desire to humiliate, all are expressions of the same urge. These detainees are objects for our catharsis. We use their bodies to pour out our fury, to take our vengeance, to purge ourselves of' the pain, to cleanse ourselves. Let us not pretend this is a cool strategy or calibrated justice. It is a ritual. It is redemption. This is what it is to be terrorised. We do not truly require the worst of the worst for this purpose. Anyone will do, on one precondition: that they remain inhuman to us. With the above in mind, we turn to Human Rights Overboard to compare Australia's experience of immigration detention. The verdict, frankly, is nothing short of horrific. This book reveals something systemically rotten. Not isolated incidents, but a repressive structure beginning before unauthorised boats arrive and continuing beyond detention. Of course, the objections to this book are predictable, so let's state up front this people's inquiry is not really an inquiry at all. Absent is the outlining and balancing of competing evidence and its quasi-judicial reconciliation. Indeed, the evidence is overwhelmingly uncontradicted, which is exactly as expected given the methodology by which it was obtained. Evidence was solicited by announcements "in newspapers and through refugee advocate networks". This clearly attracts people of a particular view. So, the inquiry heard about 200 verbal accounts and received a similar number of written submissions from former detainees, their Australian supporters, doctors, nurses, educators, lawyers and migration agents. It also drew evidence from tormer immigration department officials and detention centre employees, though these accounts emanated roundly from the disgruntled. You will not find, as you might in a formal inquiry, the responses of the prime minister or relevant immigration ministers, except by way of public statements. This remains a work of advocacy, not of dry inquiry. The result was always destined to be damning. So expect the word "bias" to be brandished aggressively by critics, as though it is some kind of unimpeachable retort. In truth, though, it answers nothing. The fact remains that the accounts captured here have never met with any meaningful explanation, and more often met with denial when put to government figures. If it is scepticism one craves, a grain of salt imply will not do here. The information gathered is so compelling, so relentless, and derived from so many diverse accounts in different parts of Australia, that accusations of' bias must be crushed under its weight. In the interests of brevity, let us focus on immigration detention. By law, it must be merely administrative, not punitive. Yet the government contracted it out to private companies whose trade is running prisons. The result was a series of'inherently, and predictably, brutalising institutions. Staff reported being punished for being nice to detainees. Detainees would be summoned by number and subjected to regular headcounts, at midnight, 2am and 6am. Some detainees told of being forced to beg for food. Medical treatment was shabby, causing many of the doctors employed in detention centres to resign. Cooks were doing psychiatric assessments; nurses were dispensing drugs. Some mentally ill detainees found themselves in solitary confinement, one with his allotted outdoor time scheduled for 4am. "...the most damaged people I've seen in my whole psychiatric career. Up until that lime I'd never met an adult onset bedwetter. I'd never met someone with psychological blindness." What astounds is the capacity of government, in the face of this human destruction, to persist with cold obfuscation. Immigration minister Amanda Vanstone dismissed detainee self-harm as "a very unattractive type of' protest" before reassuring us that "Australia has a very good record of' not giving in to such protests". The same logic was at work when three Guantanamo detainees hanged themselves in 2006 and rear admiral Harry Harris Jr dismissed it as an act of "asymmetric warfare". All of which points to the fact that links our detention stories to those of Guantarn:intro: the mythology that surrounds the detainees and allows us to live with their brutalisation. Put sinmply, such arguments are only imaginable where those concerned are considered less than human. In the case of Guantanamo, this is relatively straightforward. But Australia's immigration detention raises more troubling questions. What, exactly, permitted us to dehumanise asylum-seekers? Certainly, John Howard was sure to conscript the spectre of terrorism into the discourse, warning that these boats could be carrying terrorists. But this was a post-9/11 development. The shocking belligerence of our system predated this. The mythology of menacing "illegals" was already well entrenched by then, at least in Australia's political psyche. This was, unlike terrorism, a largely manufactured threat. At its height, unauthorised boat arrivals numbered 4175 a year: scarcely a splash. The argument that these arrivals were taking the places of other refugees who followed correct procedures overlooks the fact that the refugee quota is itself an artificial threshold. It also doesn't explain why the system had to be so rigorously violent. That is more often explained as an attempt at deterrence, a message to others who would follow that Australia is not a "soft touch". But here again we confront the fact that asylum-seekers were often so desperate that they ignored warnings against boarding unseaworthy boats. They were impervious to deterrence. Is it mere coincidence that this policy became wildest after the emergence of Hansonism? I prefer not to favour such theories, but there are few other compelling explanations. When Pauline Hanson proposed temporary visas for refugees, who could later be sent back home, immigration minister Philip Ruddock heartily condemned the idea. Then he implemented it. If these books demonstrate anything, it is the power of worst-of-the-worst reasoning to a receptive audience. Humans have an extraordinary capacity to dehumanise outsiders they need never confront and to rationalise violence against them. Yet several Australian naval staff resigned, disgusted by their own work, after intercepting unauthorised boats on government instruction. They had seen the horror on the faces of the children they were repelling with military force, and could do it no longer. In brief, they humanised them. We are beginning to see now a similar phenomenon at work in the case of former Guantanamo officials. These are openings worthy of exploration. Neither of these books tell us a great deal about the experiences of those charged with administering this violence; they would be richer if they could. A recent Four Corners program provided valuable insights into the lives of Australian immigration detention guards, who were also damaged by the process. As desperate detainees became more violent, so did they. So often is there this strange osmosis between people caught in cycles of violence. And above it all sit those who did this to them: the politicians whose policies are responsible for such suffering. We are therefore witnessing a new species of political prisoner. Genuine terrorists at Guantananmo Bay aside, these people are not imprisoned for conscious subversion. They have become pawns, trapped not for their politics, but the political interests of others. HARROWING new accounts of children suffering in mandatory detention have triggered calls for a royal commission into Australia's immigration enforcement system. A new book, Human Rights Overboard, promises to reopen old wounds - even though Kevin Rudd has guaranteed that children will never again be held in immigration detention. A boy, 3, was so unhappy that he "executed" his toy truck with a length of string. "He said to his mother, 'I have killed my truck because it is tired of being sad'," according to one witness's account. Another child, who spent three years in custody, described his anguish at acts of self-mutilation by other detainees. "It was horrible," the boy said. "I remember one time a person was harming himself up a tree and his children were crying under the tree. "His wife was crying and yelling under the tree. His blood was dripping from the tree." A doctor working for a refugee health service told how two children had overdosed on shampoo. "There is no reason why anybody would overdose on shampoo unless they had learnt that behaviour in detention centres," the GP said. "It is isolated to that particular environment." Mandatory detention of unlawfully landed asylum-seekers was introduced by the Keating Labor government in 1992, but became notorious under John Howard after serious shortcomings in the system were exposed by the bungled detention of Adelaide woman Cornelia Rau and Philippines-born Vivian Alvarez, both of whom had Australian residency. Mr Howard's Coalition government moved to soften its approach, pledging that children would no longer be detained, before losing office last November. Immigration Minister Chris Evans last month further relaxed the mandatory detention rules, while reaffirming the Prime Minister's commitment that children would not be locked up under Labor. Linda Briskman, head of the human rights centre at Perth's Curtin University, worked with two other academics, Chris Goddard and Susie Latham, to produce the book. It is based on 200 first-person accounts of conditions in immigration detention centres, many from former detainees. The testimony was collected between 2005 and last year by a so-called "people's inquiry" into detention, backed by university social-work departments. Professor Briskman said mandatory detention remained in place, despite the Rudd Government's move to make it a last resort for unauthorised asylum-seekers and visa over-stayers. But Professor Goddard, of Melbourne's Monash University, conceded there was unlikely to be the will on either side of politics for such an inquiry. The authors say 19 deaths occurred in Australian immigration centres, 12 of them at the height of the last influx of boatpeople, between 2001 and 2003. THERE have been highs and lows, heroes and villains, in Australia's treatment of refugees. In recent years, the heroes have been hard to find. This is why, in Human Rights Overboard, published this week, we are calling for a royal commission into every aspect of immigration policy. During the 1970s, thousands of Vietnamese arrived in Australia by boat. The country responded with humanity. In 1992, the Keating Labor government set in train a process that was to lead to Australia displaying a darker side. A system of mandatory detention was established, with asylum-seekers locked up without trial. With the introduction by the Howard government of temporary protection visas, the Tampa incident and the excision of Australian territory from our migration zone, refugees were treated increasingly inhumanely. They were demonised by policies and practices that were largely - and shamefully - supported by both sides of parliament. The publication of Human Rights Overboard draws together hundreds of oral testimonies and written submissions to the People's Inquiry into Detention. The inquiry, established in the wake of the Cornelia Rau scandal by the Australian Council of Heads of Schools of Social Work, exposes the secrecy and brutality of immigration processes and detention centres. The inquiry heard harrowing stories from both sides of the razor wire, stories from detainees, immigration and detention staff, doctors, lawyers and advocates. The stories reflect the experiences of the asylum-seekers: their journeys here and first contacts with Australian authorities; the processing of claims; their lives in detention; and their attempts to establish themselves after release. For many on both sides of politics, it was the treatment of children that highlighted the cruelty to all. More than 2000 children were kept in Australian detention centres for an average period of 20 months. At least one child was locked up for more than five years. So many children, so terribly damaged, for so little reason. According to a report in The Australian (August 13, 2008), Philip Ruddock now regrets the treatment of those children. But if you build a prison, you treat those inside, even children, as criminals. Especially if the prisons are out of sight. A former detention centre officer told the inquiry that many officers thought asylum-seekers were criminals: "I was once told ... you are the cat, they are the rat, and don't forget that." The inquiry heard evidence of detainees being served inadequate, maggot-infested food and of assaults on adults and children. A migration agent who visited Woomera told the inquiry: "On one occasion I was stunned to see a tall young female guard kick a small boy aged about four because he was having fun near the compound gate." Appalling conditions with ineffective avenues for remedy led many asylum-seekers to take drastic measures. Migration agent Marion Le told the inquiry: "There was a man who sewed his lips. If you met him you would be amazed that he would be driven to that because he worked with the UN and had all his documents with him, and they just totally ignored his documentation." Very young children were not shielded from distressing events; a refugee advocate told the inquiry: "One of the most poignant moments I experienced was when a three-year-old curly-haired child, who could barely speak, interrupted my conversation with his father with the words, 'Guards take my mummy."' A boy who spent three years in detention said: "The worst thing, I will never forget it, was people cutting themselves. "It was horrible. I remember one time a person was harming himself up a tree and his children were crying under the tree. His wife was crying and yelling under the tree. His blood was dripping from the tree." Children were imitating adults and harming themselves; a former detainee told the inquiry: "Children copy other people. Too (many) people go crazy inside. People standing on the fences, wanting to jump: the children look at these people." This was organised and ritualised abuse of vulnerable people, including children, by the Australian government. Even when child abuse was reported to state child protection authorities, no action was taken. This abuse of children was institutionalised, placed beyond the law. After detention ended, for many the troubles continued: the six-year-old boy who refused to go to school in case his father was taken away again; the two-year-old girl who screamed if she could not see her father. A GP working in a refugee health service reported that two children took shampoo overdoses: "There is no reason why anybody would overdose on shampoo unless they had learned that behaviour in detention centres. It is isolated to that particular environment." Then there were the deaths. The inquiry heard of mental and physical health care so substandard that it sometimes resulted in death. The inquiry has documented a total of 19 deaths in immigration detention, 12 of them between January 2001 and June 2003. We must not forget those who died on their way to Australia. As Julian Burnside has written in his foreword, the introduction of temporary protection visas in 1999 provided protection for three years only, and denied refugees the right to bring their families to Australia. This is one of the reasons so many women and children died in the SIEVX disaster: "On the night of 19 October 2001, 353 people drowned as they tried to get to Australia to be reunited with their immediate family members who had already been accepted in Australia as refugees." Ruddock has apparently only one regret, that he and others treated children so cruelly for so long. We have to ensure that no government is allowed to preside over such abuse of children - and adults - ever again. A royal commission is needed to address the abuses described and set in place practices that will prevent them in the future. The inquiry heard evidence that many elements of migration policy disproportionately penalised people who are not Australian citizens, and did so in a manner that is inconsistent with the way Australians would expect to be treated. Removing such racism, restoring human rights, and reinstating accountability should be our immediate goals. Human Rights Overboard is full of stories and quotes that bring tears to the eyes. As is so often the case, a young boy provided one of the most powerful quotes: "My mind is jumping around because the only way I could survive that place was (by) not caring, and not caring is not that easy." Many Australians on both sides of politics also worked very hard at not caring. They apparently did not care about thousands of the most vulnerable refugees, including children. Now is the time to show that we are not villains, that once again we can respond with humanity. Linda Briskman and Susie Latham are researchers at Curtin University. Chris Goddard is a researcher at Monash University. They are the authors of Human Rights Overboard: Seeking Asylum in Australia (Scribe, $35). Philip Ruddock is today once again in the spotlight as he gives evidence to the Haneef inquiry. Ruddock was Attorney-General when Dr Haneef was arrested and wrongfully charged with a terrorism offence in July last year. But Mr Ruddock's role in the Haneef affair might seem like a walk in the park when placed alongside the scrutiny that will inevitably be applied to his role in prosecuting the policy of mandatory detention for asylum seekers. Mr Ruddock, as Immigration Minister, was an enthusiastic proponent of the Howard government's cynical voting garnering manipulation of mandatory detention for asylum seekers. Detention centres like Woomera and Baxter in South Australia and Villawood in Sydney were hellholes and became the focal point of international human rights campaigns against the Howard government. Those of us who actively campaigned against mandatory detention warned that Mr Ruddock and the Howard government were putting at risk millions of dollars in future compensation claims that would be made by men, women and children who suffered psychological and physical harm as a result of their being detained. The chickens are about to come to roost. A new book, Human Rights Overboard, which hits the streets this week, chronicles in graphic fashion the serial human rights abuse that took place in our detention centres. Children watching their father hang himself, a guard kicking a young boy, women so depressed that they were catatonic. The stories are heart rending. As the authors Chris Goddard, Susie Latham and Linda Briskman note, the policy of mandatory detention "was organised and ritualised abuse of vulnerable people, including children, by the Australian government." Mr Howard, Mr Ruddock and the bureaucrats and contractors who devised and implemented the policy of mandatory dentition will be held accountable for their actions. They had a legally recognised duty of care to those they detained not to harm them psychologically or physically, and they failed to exercise that duty. Furthermore, Australia has obligations under international human rights conventions to which it is a signatory to ensure that human rights are not breached. A court can take into account the failure by government to act in a way that is consistent with those obligations when deciding if decisions taken by government were lawful. The state governments of South Australia, New South Wales and other governments which were asked to intervene and prevent child abuse, and that failed to do so, might also find themselves on the end of claims by former detainees. How the Rudd government responds to claims for compensation will be telling. In Opposition Labor cowered pathetically when it came to standing up for asylum seekers. It has a chance now to redeem itself, and ensure that the victims of the institutionalised abuse of mandatory detention do not have to spend years arguing their cases before the courts, by establishing an independent process for compensation along the lines of the processes established for those who suffered in state government care during the last century. If the Haneef affair was a dark chapter in Australia's recent past in which Mr Ruddock played a role, the abuse of asylum seekers is a whole book in which the man who got a standing ovation at the Liberal Party's 2001 election campaign launch is a central character. LARGE numbers of asylum seekers were deliberately held in detention far longer than need be, and subjected to mistreatment and gruelling conditions, according to a new report. Others were wrongfully denied asylum as a result of detention centre staff who saw their role as "gatekeepers", keeping people out of Australia, and blocked detainees' access to lawyers. This "culture of obstruction" was reflected in appeals to the Refugee Review Tribunal which, over a three-year period, overturned 30% or more of asylum applications rejected by department officers. Most Australians had no idea what was going on behind the walls of the country's detention centres, nor of the lingering damage inflicted on detainees, later found to be refugees and released, according to the Human Rights Overboard report. The report stems from a "people's inquiry" into detention, set up in February 2005 after the discovery of the wrongful detention of Australian resident Cornelia Rau. As reported by The Age, it was set up by the heads of social work departments at universities around Australia, as an alternative to the Government's Palmer Inquiry. It held hearings around Australia for over two years, taking around 400 oral and written submissions from former detainees, former detention centre workers, refugees advocates and lawyers. Former staff and medical professionals testified to abuses including bashings, and the wrongful use of medication and isolation units to "manage" disruptive or grieving detainees. A former Woomera worker described how, with no appropriate training, she had to counsel up to 12 people a day who had self-harmed over their indefinite detention. "I was dealing with people tying razor wire around their throats, using razor blades, knitting needles that they would sharpen, rope ... overdosing on Panadol, detergent, chemicals, gravel," she said. Another former worker spoke about how up to six asylum seekers were crammed into Besser-block buildings designed for one person, with no air-conditioning and temperatures in the high 40s. "There were eight toilets for 1800 people," the worker said. "There were two washing machines. There were two taps in the compound. One would often break down so there was limited access to drinking water. There was hardly any staff. They (detainees) used to line up for four or five hours in the heat just to get a Panadol." The inquiry was told of one man denied medical treatment who had to be rushed to hospital with a burst appendix; a child who had to wait six weeks for a doctor after catching her finger in a door; a man with a broken ankle who had to wait 13 days for treatment; symptoms of a 60-year-old woman "diagnosed" by management as "psychosomatic", when she had actually suffered a stroke; and a woman and a minor who lost partial sight because specialist care was withheld. The report also says that on release, detainees faced a new burden; bills of up to $200,000 for their "upkeep" in detention. A group of Australian citizens who conducted the People's Inquiry into Detention says the country should stop processing asylum seekers off-shore. The group says that evidence from extensive interviews with asylum seekers about their treatment by Australian immigration officials shows that offshore detention involved many abuses of their basic rights. These asylum seekers were often detained on islands such as Nauru and PNG's Manus as part of Australia's so-called Pacific Solution. Their experiences are documented in a new book, Human Rights Overboard - Seeking Asylum in Australia. "The detention centres are still going to be privatised, people are going to be still mandatorily detained - whether they are a newborn baby or a grandmother or whatever - so we would be advocating for the abolition of mandatory detention; for people who want to make a claim to be brought to the Australian mainland and processed within Australian law and be housed in the community while that's being determined." Could the Bad Old Days of Mandatory Detention Come Back? A new book tells the harrowing personal stories of life in detention - stories policy makers need to hear, according to co-author Linda Briskman, interviewed for newmatilda.com by Alicia Sometimes. For many Australians, the mistakes and brutality of the mandatory detention policy under the Howard government first became apparent when the stories of Australian residents Cornelia Rau and Vivian Alvarez were made public. Unfortunately these were just two cases among many. A new book, Human Rights Overboard: Seeking asylum in Australia, collects over 200 personal accounts of life in detention telling a story of suicide attempts, lack of medical care, depression, anxiety, humiliation, separation, longing and the systematic removal of dignity. What emerges is a truly astonishing narrative of neglect and abuse. The Australian Council of Heads of Schools of Social Work (ACHSSW) convened a People's Inquiry into Detention in 2005. Human Rights Overboard is one result of this citizen-led inquiry into immigration detention. Over three years, the inquiry heard the voices of asylum seekers, advocates against mandatory detention and many concerned Australian citizens. The government's own Palmer Inquiry into the Rau case, also being conducted in 2005, was deliberately limited and superficial, and many ordinary Australians felt an obligation to act. The ACHSSW conducted the People's Inquiry with very little money, a lot of good will and a many volunteers. Most were giving time on top of their day jobs. "We were so passionate about this," recalls one of the book's authors, Professor Linda Briskman. "We were so committed. We wanted to bring about policy change - which was pretty hard to do, particularly in the Howard years - and we wanted the stories of this era placed on the public record for ever and a day." Ten public hearings were held in metropolitan and rural areas all over Australia. "We received written submissions and we also went to some documentary evidence: parliamentary evidence, court cases, media reports and so forth. From those 10 public hearings a lot of the most compelling information appears in the book. It's some of that most direct testimony which is absolutely harrowing and really shows the brutality of the system. "We heard direct testimony from 200 people, and around a third of those were people who had actually been in detention. Others were advocates and activists, professional groups, people who'd worked within the detention system in one capacity or another, health professionals and so forth." "We were just open," says Linda Briskman about the process of the inquiry. "Anybody who knew about detention and had something to say about detention was welcome to come and present to us at the public hearings. And people did. When we first announced the inquiry and there was a report in The Age newspaper, we were just overwhelmed. People came forward, they wanted to help, they offered to help with the hearings, they offered to sit on panels, they said they had information that they didn't know what to do with and they wanted to speak about it, that they wanted to submit. It just grew and grew and grew. It took a few years to actually run its course." Writer and activist Arnold Zable was one of the many who spoke. He reflects upon demonstrating outside Maribyrnong Detention Centre, "I was there for one simple reason. I am alive today because my mother was a 'queue jumper'. As I know from my mother's story, when it is time to run, there is no queue. Asylum seekers do what many of us would do if faced with a similar fate." A refugee advocate who was involved with 60 refugees on TPVs told the inquiry, "One man's wife died of cancer, leaving four children. Another man's nine-year-old son was found beaten to death in Afghanistan. He and his wife desperately need to grieve together. He had been in detention three-and-a-half years and is on a TPV with over two years to wait after his son's death. In these and other cases we asked our federal Member of Parliament to ask Senator Vanstone for an urgent permanent visa but they were all refused." A father in detention told the inquiry, "I can't control my son. He tried to hang himself. My son drank shampoo two times. He drank bleach two times. He was brought by ambulance to Woomera Hospital." Unless people asked for a private hearing, the inquiry was public and open to the media. A few who were in Australia on Temporary Protection Visas (TPVs) did ask for that right. Most, however, wanted their stories heard as widely as possible. "There was a lot of pain and people expressed that as they spoke," says Briskman. "The people on the panels felt that pain too, as it was very, very distressing to hear these accounts. But what people told us was that speaking, having their stories validated, being heard, being listened to, being confirmed was part of the healing process. And some people initially, understandably, were reluctant to come forward, especially people who were still waiting for their claim's determination, but more and more came forward. They heard other people [and] they wanted to put their stories out there." The nature of mandatory detention under the current Government has changed significantly, including changes to keep children out of detention, and to impose shorter detention periods aimed at protecting the community, rather than as a supposed deterrent to would-be asylum seekers. But, as some commentators have noticed, there is a reluctance on the part of the current Government to emphasise or explain this change. It forces us to ask whether they really have the political will to confront the realities of Australia's mandatory detention history through a proper inquiry, and help prevent it's ever happening again. Meanwhile, the Rudd Government still seeks financial compensation from former detainees and is currently chasing debts worth almost $8 million. In Federal Parliament on Wednesday 3 September 2008, Greens Senator Sarah Hanson-Young asked the Minister for Immigration and Citizenship, Senator Chris Evans, "In light of the publication of a new book, Human Rights Overboard, detailing the horrific stories of children in detention and the ongoing long term psychological effects that this has had on children and their families [...] will the Minister confirm that the Government will look into establishing a Royal Commission looking into the effects that Australia's immigration policy has had on refugees?" Senator Evans thanked Senator Hanson-Young for her question and acknowledged there were calls for a Royal Commission into immigration detention. He went on to say, "The Department of Immigration and Citizenship has reviewed its detention processes, introduced wide-ranging reforms and implemented changes that have vastly improved its performance in these areas. There is increased departmental representation and oversight of detention facilities, vastly improved detention health services - which were a real weakness - and new forms of detention accommodation, and there is a new service delivery model. But I understand the concern that exists about whether these changes go far enough." When asked about change in the Rudd Government's policy, Linda Briskman answered, "We've had a few conversations with government. We put out our first, very small report, which we self-published at the end of 2006 and the Immigration Department contacted us at that time for a meeting. Since then there's been very little contact with the immigration authorities. We've certainly sent a submission to the Government. "The Government is running an inquiry now into immigration detention. We sent our book to the Minister's office. We're trying to have conversations but it hasn't been that successful to date. We hope that will happen. "There have been some changes with the Labor Government, but there are still many unanswered questions. Mandatory detention is still here to stay, there's still a very strong plank of border protection. The Christmas Island facility is still there waiting and empty. We want more detail about policy and how it will play out in the future." The oral testimonies are important and anyone reading them is affected. "We've got to have that belief that we could influence policy," says Professor Briskman. "That kept us going. It was very, very hard to influence policy and not only from our endeavour. There were many, many activists, there were many refugee and asylum seeker support groups trying their damndest to bring about change. "One person who testified to the inquiry said to us "Whatever we do, however hard we try nothing seems to change, it would be so easy for the Government to change their policies but they won't or don't." "We have some very clear recommendations in our report for the Government which we hope will be taken on board. Broadly, they're about removing racism from the system, restoring rights and bringing about greater accountability. But I think the strength is not only in trying to effect policy change, but having these stories on the public record so they are not forgotten. Never again." John Howard famously said, "We will decide who comes to this country and the circumstances in which they come." Let's hope his voice fades and those in Human Rights Overboard are not only heard but remembered, and acted upon. Senator HANSON-YOUNG (2.22 pm) -- My question is to the Minister for Immigration and Citizenship, Senator Evans. In light of the publication of a new book Human Rights Overboard detailing the horrific stories of children in detention and the ongoing longterm psychological effects that this has had on children and their families, as reported in the Australian on Monday, will the minister confirm that the government will look into establishing a royal commission looking into the effects that Australia's immigration policy has had on refugees? Senator CHRIS EVANS -- I thank the senator for her question. I know she has a keen interest in these issues. I acknowledge there are calls for a royal commission into immigration detention. I have to indicate that I am not inclined to support those calls. As the Labor opposition, we were supportive of a royal commission prior to the Palmer and Comrie reports which followed the revelations about the terrible mistreatment of Cornelia Rau and Vivian Solon. As a direct result of those very serious reports, the Department of Immigration and Citizenship has reviewed its detention processes, introduced wide-ranging reforms and implemented changes that have vastly improved its performance in these areas. There is increased departmental representation and oversight of detention facilites, vastly improved detention health services--which were a real weakness--and new forms of detention accommodation, and there is a new service delivery model. But I understand the concern that exists about whether these changes go far enough. As part of reassuring myself about that, I have appointed Ms Elizabeth Proust to undertake an independent evaluation of the department's progress in implementing the Palmer and Comrie reports to assess whether it has done what was recommended and done that fully. Her evaluation is currently underway, and I expect her report to be with me by the end of October 2008. Senator Ian Macdonald -- Let them all go. Senator CHRIS EVANS -- Sorry, Senator? Do you have a contribution to make? The PRESIDENT -- Senator Evans, your comments should be directed through the chair. Senator CHRIS EVANS -- I am just interested in what Senator Macdonald said. I am not sure whether or not the senator supports the review of those cases. But, on the recommendation of the Ombudsman, I reviewed those cases. Many have been granted visas and many have been returned to their countries of origin if they were not entitled to be granted visas. As late as yesterday, I returned to his country of origin our second longest-serving detainee. He had no right to be in this country, he had exhausted his appeal rights and he was returned. We are seeking to resolve long-term caseloads. We are trying to use those principles in assessing the remainder of the detention population. We are trying to set new directions in detention, as I outlined in a speech recently. We are committed to fundamental reform. I think that reform will help to reassure Australians that we have a system of integrity. Senator HANSON-YOUNG -- Mr President, I ask a supplementary question. I thank the minister for his answer. Does the minister accept that the government has a responsibility to assist people affected by their time spent locked up in the system, even if they are no longer detained--in particular, whether or not there will be any substantial support for the 2,000-plus children who were detained for an average of 20 months between 1992 and 2005? Senator CHRIS EVANS -- I thank the senator for her supplementary question. It would require more than a one-minute response to answer all of those issues. But, as I said, we are focusing very much on the future. It is worth noting that, in addition to the Proust review, the numbers in detention have fallen and that a joint standing committee of this parliament is looking into alternative detention methods. We have also had some research from the University of Wollongong on the effects of long-term detention. I suppose my answer is that there is a lot happening in this space. We are, of course, experiencing large compensation claims. Currently the Commonwealth has had to pay out in compensation more than $8 million already as a result of compensation for the previous government's policies, and no doubt further claims will be lodged. But I am concerned about the treatment of children under the Migration Act. It is one of the areas that I seek to address.